Tim Tebow A TE In New England?? 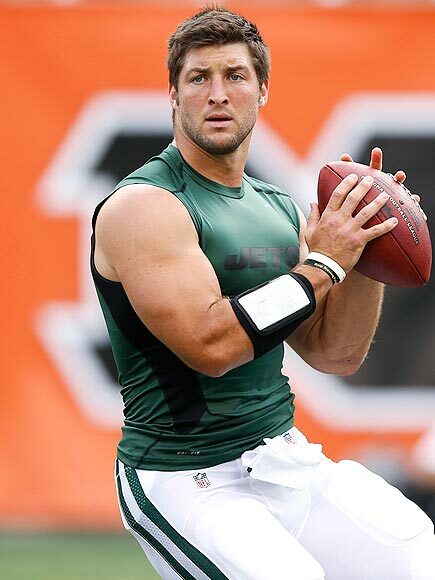 Tim Tebow… Newest New England Patriot. Ever since Tim Tebow’s junior season at Florida, our CEO has said over and over he would be a tight end in the NFL. 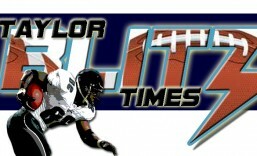 The Broncos and Patriots tried him at quarterback and all indications are the Patriots will do the same. However we are talking the master of deception in Bill Belichick. Isn’t it ironic that he is being signed when Hernandez is nicked up and Rob Gronkowski is due to have surgery on his arm (again) and then his back. Truth be told we may never see the “old Gronk” again through all these injuries. This is a team that brought in Kellen Winslow Jr last year to shore things up. So now the speculating begins as to where Tebow will play. So let’s ask some hardline questions. Do you really think Belichick will take this generation’s best quarterback in Tom Brady off the field to accomodate a 46% passer?? Even if the Patriots trade incumbent 2nd stringer Ryan Mallett, do you think Belichick will take practice time from Brady to run a “read option offense so Tebow can take his place?? If he’s going to be a third string QB and help on the scout offense to prepare his defense for mobile quarterbacks, couldn’t Belichick have done it cheaper?? Tebow’s league minimum for 4 years of service is $70K higher than a rookie. Even though he worked out with the quarterbacks exclusively, Belichick nor anyone else poured cold water on Tebow playing another position. Don’t forget this is the coach who deployed Troy Brown as a cornerback when there was a shortage of corners. He also platooned LB Mike Vrabel as a TE, who scored in Super Bowls, and DT/DE Richard Seymour as a blocking back. Is it really far fetched to think of Tim Tebow at another position?? Rob Gronkowski is 6’6 265lbs., Aaron Hernandez stands 6’2 250 lbs, and Tebow is of the same build type at 6’2 236 lbs. Don’t forget that Hernandez was his college teammate for 3 years at the University of Florida. Just like the media when it tries to pry information out of Belichick, you know there is more there than meets the eye. The Chancellor sees the Patriots transforming Tebow into an H-Back- TE Hybrid like former Miami Dolphins. 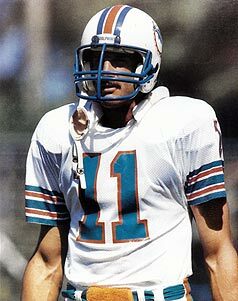 Remember him wearing #11 for the Dolphins?? Ironically, he stood 6’4 215 lbs. You could almost hear the television announcers last night on NFL Network: “If you’re just joining us Tim Tebow has a chance to do it again.” Invesco Field at Mile High sprung to life when the Broncos came onto the field with just over 5:50 to go. We don’t want to say the New York defense looked defeated as they took the field but they had somewhat of a demoralized pace and demeanor . You could see the look on their faces which seemed to say “How did we let ourselves get in this position?” Then Tebow went to work. Remember back in the 1987 season when defenses started to defend a young John Elway with spies?? These were normally reserve defensive backs that played 5 yards off the line of scrimmage and mirrored the quarterback once he stepped up and threatened to run they would come up as delayed blitzers. They did this with Randall Cunningham also yet I digress. We hear of all the pundits getting on Tebow’s passing ability but let’s not forget Roger “The Dodger” Staubach, Terry Bradshaw, Kenny “The Snake” Stabler, Fran Tarkenton, and many of the greats had to rely on their running ability before they developed downfield throwing prowess. In the famous game with the “Immaculate Reception” before Franco Harris won the game, it was Kenny Stabler who scrambled 30 yards for a TD to give the Raiders a 7-6 lead. When the Cowboys won Super Bowl VI, Staubach wasn’t the full time starter until week 7. Even in the Super Bowl Staubach ran more times than he passed it in the first half (9 to 6). Right now Tebow can get away with games where he just runs the football and should develop as a down field passer. Again Orton had far superior passing yards yet the Broncos were 1-4 with him passing. Looks like the Broncos will be playing “Wing-T” or “Wildcat” football for now. There are many times in a players career where they will be at a crossroads as to what they should do or question whether they chose to attend the right school. What happens when you replace a legend?? What must that crucible be like to go through to follow one of the most celebrated athletes in the history of college football?? For John Brantley of Florida, its been a compelling study. He was more than familiar with the legendary Tim Tebow having played his high school ball right there in the state of Florida. In fact he broke Tebow’s record for touchdown passes by a Florida prep quarterback with 99, while attending Trinity Catholic in Ocala, Florida. What’s made this journey so compelling is what he’s had to endure and yet remain a leader for the Florida Gators. The first thing that comes to mind is listening in stunned amazement, as he was booed at home against Miami of Ohio. It was the first game of the post Tim Tebow era and the Gators were on their way to a 34-10 win. Yet in the second quarter the offense was sluggish and bogged down a few times. One time the camera panned in close to him on the sideline when the crowd at Ben Hill Griffin started in and you couldn’t help but feel for him. “The Swamp” let the team have it and let’s be honest, they were on Brantley for not being Tim Tebow. We never heard that during Tebow’s years. You couldn’t help but feel for him on that day and it cast a pall over that game and the rest of an 8-5 season. Urban Meyer’s last year at the helm. In 2010, Brantley had a sporadic year throwing for 2,061 yards while completing 200 of 329 for 9TDs and 10 int’s. Yet keep something in mind, he has always been a drop back passer and nowhere in Urban Meyer’s offense had he been developed plays that accentuated his talents. Not in the way that there were specific plays to aid Tebow early in his career. Think back to win Tebow stepped in and played as a freshman while Chris Leak was still there. They developed plays for Tebow that would grant him success early on, to build confidence and get to learn the college game. Brantley wasn’t afforded that luxury. Had he been, where would he be on the path to success right now?? Yet one of the intangibles that did forge was was an unshakable belief in himself. A quarterback who was unsure if he’d remain in Florida’s future, stayed with his commitment and was awarded Offensive Co-ordinator Charlie Weiss. Weiss is an offensive guru with a serious hand on the pro passing game that accentuates Brantley’s strengths. At 6’3, 219 lbs as a drop back passer who can see over the rush, Brantley should throw for more than 30TDs this season. Weiss knows the passing game that will take him to the next level and beyond in the NFL. Think not?? Look, last year Kansas City Chief’s quarterback Matt Cassell was among the NFL’s leading passers with 27TDs and only 7 ints. Without Weiss, he’s thrown for 3 TDs with 5 ints in only 3 games. Seriously…not making that up. Brantley will further develop in Weiss’ system and the SEC will be his foil as he improves on his accuracy. Do you realize that his efficiency rating is 148.1 this year as opposed to 116.4 last year?? http://espn.go.com/college-football/player/_/id/235158/john-brantley Does he have the right guy to elevate his game in Charlie Weiss?? Listen it was under his tutelage that journeyman quarterback Vinny Testaverde became a pro bowl quarterback in the NFL for the first time after 12 years. Then he developed a young Tom Brady into being a Super Bowl winning quarterback. What do you think he’ll do with a pro prospect like Brantley against 18- 20 year olds in the SEC?? With Brantley, the SEC will be a foil as he develops his game. It’s almost a shame it had to come so late in his career but with a showdown with conference leader Alabama, what better time than to showcase his talent than now?? Showcase he’s dodged the burbs of football pundits and rival fans. Although I am a Miami Hurricane fanatic, I know a real dropback passer when I see one. He’s an excellent pocket passer who should do well in today’s game against the Crimson Tide. He will grow over the next couple of months into a total pro quarterback prospect. Prediction…?? Is Alabama really ready for a quarterback who once outperformed Cam Newton?? Not, Gators! !